So many kids from West Philadelphia don’t even know these opportunities exist for them. Many come from single-parent families whose mom or dad (or in many cases their grand mom) is working two jobs to survive and are just (understandably) too plain tired to do anything else in the few short hours they’re home. Many have teachers who are overburdened and too stressed to find the time to help every kid that needs it. Many of these kids don’t have the brains to figure this out themselves – like my kids. Except that my kids are just lucky enough to have parents and a well-funded school system around to push them in the right direction. Technology can help these kids. But only if the kids want to be helped. Yes, there is much inequality. But the opportunity is still there in this country for those that are smart enough to go for it. Personal motivation will always play a role in individual success. But assuming that children need to simply be “smart enough” to go after available opportunities glosses over a complicated picture. Children don’t operate independently of the environment or adults around them. Although Marks points out tools that would be useful to any kid, most of them have to do with having Internet access. He writes that the few teachers he knows tells him “that many inner city parents usually have or can afford cheap computers and Internet service nowadays.” But that’s simply not the case; in D.C., where nearly the entire city is wired for high-speed Internet, very few residents in low-income communities are connected, an Investigative Reporting Workshop study found. The suggestion to Skype with friends about homework or watch a TED educational video isn’t feasible if you’re using dial-up. D.C. does have opportunities for children in need, such as scholarships. The city also has a lottery system for children to get into well-performing schools. But there aren’t enough scholarships for all children and not every child will be placed into the school of their choosing. Increasing awareness of available resources is helpful, but it alone can’t solve widespread poverty. If it were that simple, “smart black kids everywhere would be bursting down the doors of this nation’s most elite universities,” Edward James writes on Black Youth Project. Reducing poverty is a complex endeavor. D.C., like many other cities, is home to food deserts where access to affordable healthy food is limited. According to the U.S. Department of Agriculture, 13 percent of D.C. households suffer from hunger [PDF]. Children who don’t eat nutritious meals have trouble focusing in school. Pulling yourself up by your bootstraps, as a child, is sure hard to do if you’re doing it on an empty stomach. If I was a Forbes writer, I would learn how to use the subjunctive. I dunno… I think some of what he said had a lot merit. I think the level of victimhood in the black community is clouding people’s judgement. 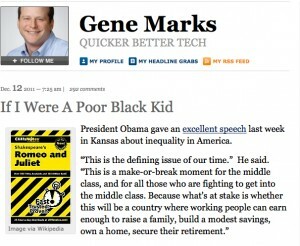 I know a few “poor black Kids” who have better technology than I do, and I work in the IT field.